When you launch the lesson, there will be a brief overview of how to use lessons. After that you will be asked to pick an Edition, in case you have created multiple editions of the selected lesson. Press Select to access the lesson. Or click Customize to make a new edition of the lesson. The first allows you to make a copy to create a new edition of the selected lesson. Or you can switch to a different edition of the lesson in the middle of another lesson. The fourth allows opens up a new window with the Student View for you to project. 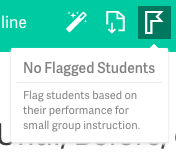 The next button allows you to call your student's attention when you are modeling or sharing student answers. Then you have the button that allows you to save your place in the lesson for the class in case you didn't finish the lesson. Lastly, there is a button that goes through a tutorial on how to use Lessons and commonly asked questions.